We have discussed about scalar functions in Part 29 and Inline Table Valued functions in Part 30. In this video session, we will discuss about Multi-Statement Table Valued functions. Multi statement table valued functions are very similar to Inline Table valued functions, with a few differences. Let's look at an example, and then note the differences. Let's write an Inline and multi-statement Table Valued functions that can return the output shown below. 2. Inline Table Valued function cannot have BEGIN and END block, where as the multi-statement function can have. 3. Inline Table valued functions are better for performance, than multi-statement table valued functions. If the given task, can be achieved using an inline table valued function, always prefer to use them, over multi-statement table valued functions. 4. 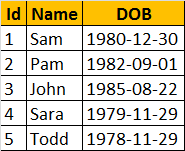 It's possible to update the underlying table, using an inline table valued function, but not possible using multi-statement table valued function. Internally, SQL Server treats an inline table valued function much like it would a view and treats a multi-statement table valued function similar to how it would a stored procedure. is there any difference between procedure and view?performance wise which is best? Use stored procedure over function for better Cache Plan.